Lightning took to the pitch determined to get the better start, but it was Saracens that took the early lead, pushing a driving maul over the line after just 6 minutes of play. It wasn’t long before their lead had increased to 19-0 after capitalising on several Lightning mistakes. Not going down without a fight Lightning took charge, driving their line out over the line in the dying moments in of the half, taking the score to 19-7 at half time. With the second half under way it was Saracens who were first to draw blood, pushing their driving maul over from 5 meters out extending their lead to 24-7. 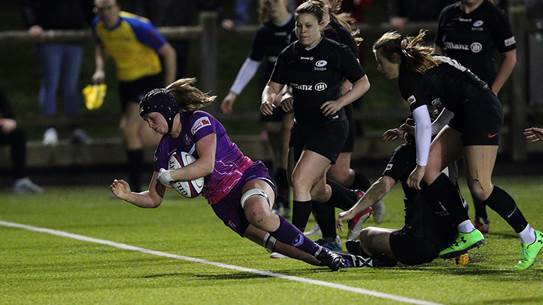 Finding another gear, Lightning started to take charge, scoring two try’s through Liv Jones and Daleaka Menin bringing Lightning to within touching distance on Saracens, 21-24. With five minutes to go, Lightning took the lead for the first time in the game through number five Sarah Bonar, who crashed across the line from the back of a driving maul taking the score to 28-24. However, it was not to be the fairy tale ending that Lightning would have liked, with Saracens crossing the whitewash in the dying moments of the game, tipping the score back in their favour and securing the win 31-28. Lightning’s next match is on the 30th March against Richmond.